World markets continued to boost on Thursday. It was caused by good economic data from the United States. Initial Claims and Q3 Non-Farm Payrolls proved to be better than the tentative forecasts. S&P 500 and DJI hit new historical highs once again. The trading volume on US exchanges fell to 6 billion stocks, 18% below the 5-day average. Obviously, investors are not that active as they expect the official data release on the US labor market today at 13-30 CET. In our opinion, the outlook is positive. Note that the Fed Chair Janet Yellen is expected to give her speech today at 15-15 СЕТ. It may affect the exchange rates. The US dollar index went on rising yesterday. We consider that basically it was boosted by the ECB President Mario Draghi’s speech and the subsequent euro depreciation. He mentioned the possibility of the increase in money printed to 3 trillion euro, if this amount is needed to strengthen the EU economy. Let us remind you that the ECB meeting took place on Thursday. The rate was remained unchanged at 0.05%. Mario Draghi’s speech pushed European markets. Stoxx Europe 600 updated the 5-week high. Investors deem that part of the additional liquidity from the euro issuing may also influence the stock market. Extra good news from Europe was the Markit’s Retail Sales. Good indicator performance of German foreign trade in September has been released this morning, and also relatively poor data on industrial output in Germany. This may help European stock markets and euro to rise slightly. There is no especially significant statistics released for today in the EU. Nikkei is moving in a narrow range the whole week. Investors expect some macroeconomic data, indicating the current yen weakening really helps the Japanese economy. Note that in late October the Bank of Japan announced it would print from 8 to 12 trillion yen every month to boost the economy. Technically, the money printing is determined for purchasing Japanese government bonds, and that scheme is equal to the Fed’s QE3 program. There is a possibility for Nikkei to rise in case positive economic data releases. According to the investment company Nomura Securities, last week foreign investors bought futures on Nikkei and Topix amounting to 831.7 billion yen ($7.21 billion). This is the highest volume for the last 10 years. The total amount of net buying positions on Japanese stock indices opened by foreign investors reached the annual high and totaled 1.37 trillion yen. World oil prices halted slightly the decline after the reports on a possible reduction in oil production (500K bpd.) at OPEC meeting on November 27. This opinion was formed after the OPEC outlook release regarding the demand on its oil in 2017 would fall to the lowest level in 14 years, 28.2 million bpd. Currently, it produces 30.97 million. 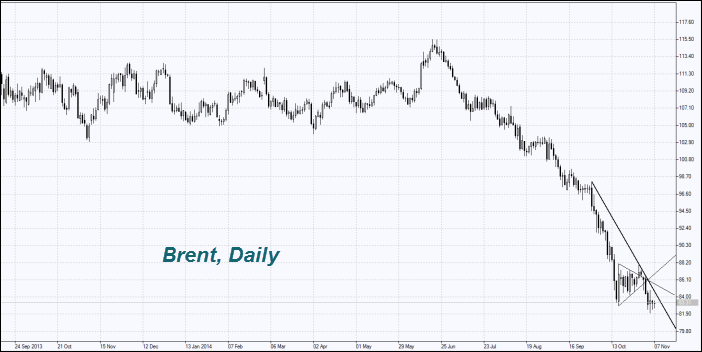 We assume the world Brent crude prices would return to $90 per barrel if the production cuts by 1 million bpd. Note that the price of $90 at the beginning of the year was considered to be balanced for oil producers and consumers. Amid falling oil prices and economic sanctions imposed on Russia, there is a strong depreciation of the Russian ruble. In our opinion, it will keep moving along the Brent crude prices, and in theory, that can be used for trading strategy development .